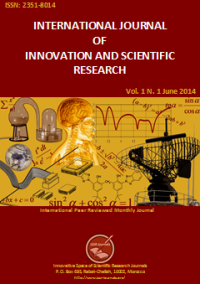 International Journal of Innovation and Scientific Research welcomes author submission of papers concerning any branch of Innovation and Scientific Research. All submissions are subject to a blind peer-review process. Articles submitted should not have been previously published or be currently under consideration for publication any place else and should report original unpublished research results. All articles are distributed under the Creative Commons Attribution License, which permits unrestricted use, distribution, and reproduction in any medium, provided the original work is properly cited. Furthermore, any claim should be reported directly to the Editor-in-Chief, who is unequivocally committed to providing swift resolutions to any type of problem.